Discredit an Ashlander's claim to the title of Nerevarine. 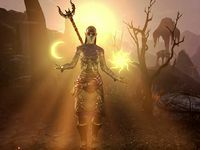 Vivec City — Explore Vivec City and meet Lord Vivec of the Tribunal. Archcanon Tarvus agrees that Chodala is somehow involved in Lord Vivec's loss of power. He wants me to confirm his involvement and find a way to get his staff without starting a war with the Ashlanders. Head to Ald'ruhn and talk to Seryn. Find Wise Woman Dovrosi at the Cavern of the Incarnate. Commune with the Failed Incarnates. Attend the Ashlander tribal council meeting in Skar. Start this quest by talking to Archcanon Tarvus in Vivec's Palace. "After further examination of the documents your brought back, I have to agree with your assessment. The Ashlander Chodala has somehow siphoned divine energy away from Lord Vivec." So you know how to restore Lord Vivec's power? "Not exactly, but now that we know that the affliction isn't natural, we can work toward a solution—one that probably involves Chodala's staff. 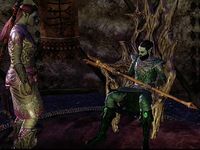 How the Ashlander got his hands on Sotha Sil's tool and turned it into a weapon is beyond me, though." You want me to acquire the staff called Sunna'rah? "Eventually, but we need to be cautious. If Chodala is as respected as you say, attacking him would start a war we can't afford to partake in. Go to Ald'ruhn and talk to his sister, Seryn. I don't trust her either, but she worked with you before." I'll go talk to Seryn. "Get to Ald'ruhn and locate Seryn. She needs to tell us more about Chodala and then help us acquire his staff. Without it, we can't restore Vivec. Meanwhile, I need to placate the populace. 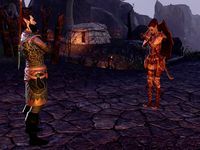 The people grow concerned over VIvec's continuing isolation." Leave the palace and return to Ald'ruhn. Seryn will be waiting for you in the Urshilaku Tribe's camp within the settlement, and will call you over when you get near. "I've been thinking about my brother's claim that he's the Nerevarine since last we spoke. No matter how I try, the word tastes false on my tongue. And now I fear he's about to convince the Wise Woman that his quest for power will benefit the tribes." "My brother is respected and revered. He has allies in all of the tribes, not to mention his personal Red Exiles. We have to proceed with caution, respect the Ashlander customs and traditions. Anything else will lead to violence and bloodshed." "We talk to my brother. Try to convince him this isn't the way. Barring that, we make sure the Wise Woman doesn't get drawn into his madness. Whatever Chodala says or does—don't attack him! We don't need a war between the Houses and the Ashlanders." Seryn will enter Wise Woman Dovrosi's Hut. The Wise Woman is not there, but Chodala is, holding Sunna'rah and lounging in the Wise Woman's chair. Seryn: The Wise Woman…I was hoping she'd be here. Chodala: You're too late, dear sister. Despite your protestations, the Wise Woman has gone to the Cave of the Incarnate to confirm my claim. Seryn: Brother, do you really want to pursue this dangerous course? Chodala (standing): There was a time when you gave me your unconditional support, Seryn. I miss those days. Chodala leaves the hut, giving you a chance to confer with Seryn. "My brother Chodala is about to do something foolish—and dangerous. But by dusk and dawn, Azura put you and I on the same path for a purpose. I just hope we have enough time." What's Chodala going to do? "He's about to claim the title of the Nerevarine and try to unite the Ashlander tribes gathered here. He already convinced the Red Exiles to support him. He's using them to intimidate the other tribes. If he persuaded the Wise Woman to his cause …." Tell me about the Wise Woman. "Wise Woman Dovrosi, the most respected councilor and spirit guide this side of Red Mountain. She went to the Cavern of the Incarnate to meditate on Chodala's claim. If she confirms my brother's assertion, the tribes will follow wherever he leads." We need to talk to the Wise Woman. "Agreed, but I dare not leave Chodala alone with the tribes. I feel the hand of Azura in all this. Go to the Cavern of the Incarnate and talk to the Wise Woman. I'll stay here and try to keep things under control until you return." Then I'll head for the Cavern of the Incarnate. "The cavern's to the northeast of Ald'ruhn, on the other side of the mountain. Hopefully, the rumbling and lava won't slow you down too much. Get to the cavern and talk to the Wise Woman. If she accepts Chodala's claim about the Nerevarine …." Leave Wise Woman Dovrosi's hut. As you walk past the bonfire in the center of Ald'ruhn, you can see Chodala talking with Gulakhan Yus-Zashten. Chodala: She won't refuse my claim. But just in case, make sure the Red Exiles are ready. Yus-Zashten: Your word is law, Nerevarine. The Cavern of the Incarnate is located on the north-west side of Red Mountain. The easiest way to get there is using the Valley of the Wind wayshrine, then heading south along the path. It is also possible to get to the cavern by heading east from Vos. As you approach the entrance to the cavern, you will see Wise Woman Dovrosi being attacked by three Skaafin. She tells them, "Azura is my shield, you foul creatures." Defeat them and rescue her, and she will then be interested in talking about your quest. Follow her into the cavern to talk. 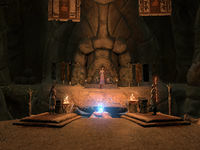 When you enter the cavern, Wise Woman Dovrosi will be talking to the statue of Azura. Dovrosi: (to Azura) An Outlander? Surely there must be another way… No, my lady, of course not. I'll do as you ask. (to you) Come here, Outlander. We must talk. "It feels strange to talk to an outlander in such a sacred place, but the Queen of the Night Sky insists. I need to render judgment on an important claim, and she says you can help me reach the correct decision." This is about Chodala and the Nerevarine, right? "Words of truth from the mouth of an outlander. Remarkable. The Red Exiles and a few others believe that Chodala is the Nerevarine. He's convinced them, but not me. I came here to consider my options. I fear a bloodbath if I oppose his claim." Isn't there a way to prove he's not the Nerevarine? "Perhaps, but I must remain impartial. If someone else reveals the flaws in Chodala's claims by comparing him to the failed Incarnates, that might do the trick." "We thought the Incarnates were possessed by the spirit of Nerevar, but each had a critical flaw that made them destined to fail to fulfill the prophecy. Their spirits reside here. Yes, you should speak to the Incarnates. I see Azura's wisdom now." How do I talk to the spirits of the Incarnates? "Take this pouch of blessed grave dust. Sprinkle a pinch upon the bones of the Incarnates to call forth their spirits. Return to Ald'ruhn after you have learned all you can. Perhaps we can curb Chodala's ambitions before they lead us to war." 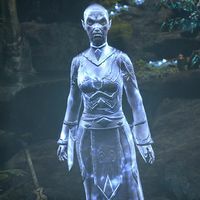 Wise Woman Dovrosi then leaves the cavern, but not before telling you one last thing, "We need knowledge to defeat Chodala, Outlander. Listen well to what the Failed Incarnates have to say." There will be three marked Incarnate Corpses for you to commune with. Go to each one and use the Pouch of Blessed Grave Dust. A spirit of each Incarnate will rise up, tell their tale, and give you their scroll. "We are the failed Incarnates, the Ashlanders who proudly proclaimed themselves to be the Nerevarine but were found wanting. The Lady of Dawn and Dusk urged us to cooperate, so ask your question, Outlander." What flaw made you fail to fulfill the prophecy? "Take my scroll and help the Wise Woman see the lie of unbridled power. I thought myself the reborn Nerevar, for I was the strongest, most powerful warrior in all the land. But power alone won't save my people. In the end, it couldn't even save me." "Once I was the hope of my people, but then my claim was proven false. Now I wait and I hope for the Nerevarine's return. State your question, Outlander, and I shall do as Azura urges." They decided you weren't the Nerevarine. Why? "To fulfill the prophecy, I followed a path of blood and war. In the end, my path became a road that led to nowhere and I was cast down from my lofty spot. Take my scroll and help the Wise Woman understand the futility of a senseless war." "The Nerevarine remains a promise unfulfilled, and I am as guilty of prideful posturing as every other Failed Incarnate that occupies this hall. Ask your question and let's be done with this, Outlander." What ended your quest to become the Nerevarine? "The Nerevarine must listen as well as proclaim. I refused to accept wise counsel, which led to the doom of my tribe and the end of my quest to embody the spirit of Nerevar. Take my scroll and remind the Wise Woman that wisdom ignored is ignorance." Once you have talked to all three, you should have Incarnate Aduri's Scroll, Incarnate Danaat's Scroll, and Incarnate Ranso's Scroll. Azura will now want to talk to you, calling out, "Mortal, let us speak." You can talk to her through her statue, like the Wise Woman did earlier. "I foresaw your usefulness before you even set foot in Vvardenfell. Now comes a test that will challenge your ability to separate truth from lies. You must convince the tribes that Chodala is not the Nerevarine." I communed with the Incarnates, just as the Wise Woman commanded. "Dovrosi's wisdom outshines most other mortals. She recognizes the futility of Chodala's claim. If she rebuffs him, however, the tribes will turn on each other and blood will flow. The staff, Sunna'rah. It makes Chodala confident, reckless." The staff is the source of Chodala's power. "Your instincts serve you well. Chodala's path took a dark turn. However, my sight clouds when I look too closely. Sotha Sil built Sunna'rah, but he did not create it with this vile purpose in mind. You must act on my behalf—and Vivec's." "Then go. Return to Ald'ruhn and help the Wise Woman reveal the falsehood of Chodala's claim. And let Seryn assist you. She is my champion and a trusted friend of all Ashlanders." Leave the cavern and return to Ald'ruhn. Seryn will be waiting for you by the bonfire. "The Wise Woman returned from the Cavern of the Incarnate and went right into Skar to meet with the tribes. Chodala's in there, too, about to be named the Nerevarine. Tell me you came back with something to stop my brother's rise to power." I spoke to some of the Incarnates and they gave me these scrolls. "Ah, of course! Use the tales of the Failed Incarnates to counter Chodala's arguments. That's brilliant! Well, except for one problem." "An Outlander has no status in the council. The Ashlanders won't listen to a word you say. Someone else has to present the arguments. Someone they trust. I suppose that means I have to challenge my brother. With your help, of course." How can I help you if I can't talk during the council? "You spoke to the Incarnates, not me. I'm familiar with their stories, but I'll need you to help me choose the appropriate argument to counter each of Chodala's claims. I hate opposing my brother in this. I just don't see another way." When should I give you Incarnate Ranso's scroll? "Incarnate Ranso was strong and powerful. He thought that by strength alone he could unite the Ashlanders. He failed. When Chodala proclaims his power, that's when we'll refer to this scroll's sad tale." When should I give you Incarnate Aduri's scroll? "Incarnate Aduri was a champion of my people. She defended us against great threats. But when she grew to love war for war's sake, she proved she wasn't the Nerevarine. When Chodala proclaims that war is the answer, hand me this scroll." When should I give you Incarnate Danaat's scroll? "Incarnate Danaat thought his way was the best way. He rejected the counsel of the Wise Women and the Ashkhans. Something Nerevar would never do. When Chodala proclaims he knows better than anyone, we'll use this scroll." All right, let's go dispute your brother's claim. Now it's time to attend the meeting in Skar. Enter the building and head down to the platform where Seryn is standing. Chodala will already be there and speaking. Chodala: Must we continue this farce? It's obvious that I'm the Nerevarine. Wise Woman Dovrosi: Someone has stepped forward to challenge your claim, Chodala. Chodala: Seryn? I'm disappointed in you, dear sister. Wise Woman Dovrosi: Enough. I shall hear your arguments and render my decision. Chodala: Even the Outlander can see that I am the most powerful Ashkhan. My strength alone proves that I am the Nerevarine. At this point, you will be able to talk to Seryn, and tell her which scroll to use. 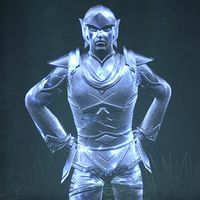 Incarnate Ranso was the one who failed because he thought strength and power alone made him the Nerevarine, so tell Seryn to use his scroll. She will take it and command the spirit of the Incarnate to appear. Incarnate Ranso: As a warrior and as an ashkhan, I was the most powerful of my age. But for all my strength, I failed my people. Don't follow my example. The spirit fades and Chodala moves on to his next argument. Chodala: The faithless Houses dare to threaten our land, but we shall meet them in battle and I will lead us to victory. Talk to Seryn again. Senseless war was Incarnate Aduri's undoing, so tell Seryn to use that scroll and summon that ancestor. Incarnate Aduri: I thought the path to the Nerevarine was a path of blood and battle, but my love of war was my undoing. War is not the way. Chodala: These Failed Incarnates prove nothing! I need no counsel but my own, as befits my status as the Nerevarine! Talk to Seryn one more time. The only option left should be Incarnate Danaat's scroll, which fits as he too rejected others' advice. Incarnate Danaat: I refused to accept the counsel of the Wise Women and the Ashkhans. I thought I knew best, but I knew nothing. That is not the way of the Nerevarine. His spirit fades, and Wise Woman Dovrosi is ready to render her judgment. Dovrosi: Seryn and the Outlander...their arguments have merit. Chodala, we deny your claim. You are not the Nerevarine. Chodala: This proves nothing! Look how the staff protects me. I am the Nerevarine! Chodala runs out a side door of Skar, while some Red Exiles enter. The Red Exiles will attack in two waves, and then Gulakhan Yus-Zashten will enter to fight you. Once you have defeated her, leave Skar and find Seryn. As you approach Seryn, she is possessed by Azura. Azura: Mortal, I would have words with you. "Mortal, I would have words with you." "Chodala has been revealed as a failed Nerevarine, but that hasn't dissuaded him from his reckless course of action. As long as he wields the staff, he shall be unstoppable." "Time is against you, mortal. Even now Vivec, that pompous usurper, grows increasingly weaker. As much as I deplore him, Vivec cannot fall to Chodala's vile magic. There's another power at work here, one I can't quite put my finger on …." "Return to Vivec City. Do what you can to aid Vivec. And pay heed to my faithful vessel, Seryn. I name her Champion of the Moon and Star. She will play a pivotal role in ending her brother's march toward godhood—if she survives." I'll return to Vivec City. If you talk to Seryn again after this conversation, she says that she'll track down her brother while you report back to Vivec City. Return to Vivec's Palace and talk to Vivec. This completes the quest. The Archcanon is standing nearby, and says "Due to Lord Vivec's condition, it falls upon us to find the solution." Talking to the Archcanon starts the next quest, Divine Intervention. Instead of confronting Chodala directly, the Archcanon suggests I return to Ald'ruhn and talk to his sister, Seryn. She was willing to help me last time and might be willing to do so again. I reached Ald'ruhn and located Seryn. It looks like she was expecting me. I should talk to her. Seryn wants to try to talk to her brother. She warned me that we need to follow Ashlander traditions in this; if I attack Chodala, it will just lead to war. I should follow her into the Wise Woman's hut and talk to her. Seryn asked me to journey to the Cavern of the Incarnate and talk to the Wise Woman. She wants me to convince her not to support Chodala's claim that he's the Nerevarine. I reached the Cavern of the Incarnate to find the Wise Woman under attack! I need to rescue her. I rescued the Wise Woman from her Daedric attackers. 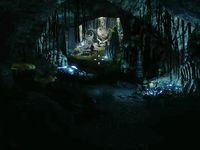 Now I should meet her inside the Cavern of the Incarnate and talk to her about Chodala's claim. The Wise Woman said we need knowledge to discredit Chodala's claim. She gave me grave dust so I can commune with the spirits of the incarnates—failed Nerevarine from previous generations—to build an argument against Chodala. 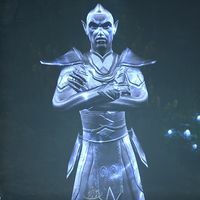 Azura, the Daedric Prince of Dawn and Dusk, manifests from the great statue and commands that I speak with her. Azura bade me to take the words of the Incarnates and return to Ald'ruhn. I need to let Seryn know what I discovered. 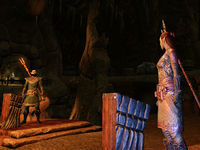 The Ashlander tribal council is meeting inside Skar in Ald'ruhn. I should go inside so I can help Seryn convince the tribes that Chodala isn't the Nerevarine. Since I can't speak in the Ashlander council, I need to provide Seryn with the proper scroll at the proper time. Hopefully, the examples each scroll demonstrates will convince the tribes not to accept Chodala as the Nerevarine. Chodala refused to bow to the Wise Woman's decision and revealed that the staff protects him from harm. He ordered the Red Exiles to destroy the council of tribes. I need to protect the tribe members and stop the Red Exiles. Seryn went after her brother. I should follow her. Azura has taken possession of Seryn and wants to talk to me. I should see what she has to say. Azura urged me to return to Vivec's Palace immediately. I need to see how Vivec's doing while Seryn tracks down her brother, Chodala. Finishes quest Lord Vivec looks terrible! He's even weaker and more enfeebled than he was the last time I saw him. I should talk to him and see if there's anything I can do to help. This page was last modified on 28 October 2018, at 11:18.